David Cameron has warned leaving the EU will put UK jobs at risk as London mayor Boris Johnson delivered a major blow to the Prime Minister by joining the Out campaign. Mr Cameron insisted the country was “safer and stronger” within the EU and said that leaving would be a “leap in the dark”. But Mr Johnson, speaking to a media scrum outside his London home yesterday, said the Prime Minister’s re-negotiation had failed to deliver fundamental change in Britain’s relationship with Brussels. His decision, putting an end to months of speculation, is a huge boost for the Out campaign potentially giving it a popular figurehead able to connect with voters in a way few other Westminster politicians can manage. Meanwhile SNP leader Nicola Sturgeon yesterday warned that a vote to leave the EU on 23 June against Scotland’s will would “almost certainly” trigger another independence referendum. In an early sign of the bitter battle among Tory heavyweights, Mr Johnson and other party grandees ­rejected the Prime Minister’s claims that the UK would be left powerless over key areas such as business regulation and security following a Brexit. Mr Johnson, who is seen as one of his party’s “big beasts”, will join justice secretary Michael Gove and ministers Iain Duncan Smith, Chris Grayling, John Whittingdale Priti Patel and Theresa Villiers in declaring his backing for the anti-EU campaign. Amid chaotic scenes outside his home, Mr Johnson insisted that he had agonised over the decision before finally declaring his hand yesterday evening. He said: “The last thing I wanted was to go against David Cameron or the government but after a great deal of heartache I don’t think there is anything else I can do. Mr Johnson said that after much soul-searching he now believes the time has come for Britain to end its EU membership, in what represents the biggest boost to the Out campaign so far. The London mayor, who attends Mr Cameron’s cabinet meetings, said the EU was a “political project” that was in “real danger of getting out of proper democratic control”. 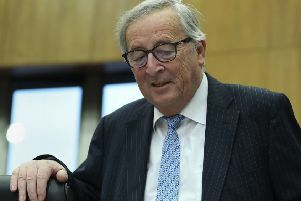 He praised the Prime Minister for the deal he negotiated with EU leaders to reform the British relationship with Europe, saying Mr Cameron had done “fantastically well” in a short space of time. Renegotiations on the UK’s relationship with Europe were finalised on Friday night after intense wrangling at a two-day summit in Brussels. The agreement, which will take effect immediately if the UK votes to remain in the EU, include changes to migrant welfare payments, safeguards for Britain’s financial services and making it easier to block unwanted EU regulations. He added that he did not intend to take part in “loads” of debates with other members of his party and insisted he would not share a platform with figures such as former Respect MP George Galloway. The stark intervention by Mr Johnson came despite Mr Cameron issuing a last-ditch appeal to him not to join the campaign for Britain to leave the European Union. “I would say to Boris what I say to everybody else, which is that we will be safer, we will be stronger, we will be better off inside the EU,” he said. Mr Cameron had also said that after a Brexit, the UK would have to sign up to all the rules of the EU. He said “it could cost jobs” and “would be a step into the dark”. “Would you have the power to help businesses and make sure they weren’t discriminated against in Europe? No you wouldn’t.